On view at Honor Fraser is an exhibit of Ed Ruscha’s work, though perhaps not in the sense that one would expect. 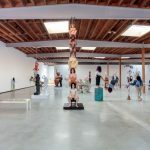 The apt title points to the plethora of works both small and large that the artist has completed since first beginning his career nearly six decades ago. 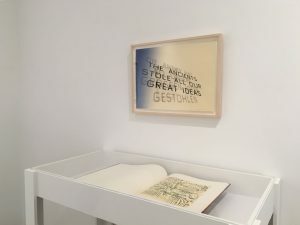 Associated with many movements spanning Pop, Surrealism and Conceptual Art, Ruscha has dabbled in painting, printmaking, drawing, photography, film and more. The sheer volume of work on display offers a deep dive into Ruscha’s technique and vision. Included are unmistakable pieces like Wall Rocket (2013), a lithograph with words floating upon a vague landscape. If one is even remotely familiar with Ed Ruscha, chances are the famous SPAM or OOF oil paintings will be instantly recognizable. Other popular and often referenced works are his gradient renderings of “STANDARD” gasoline stations. 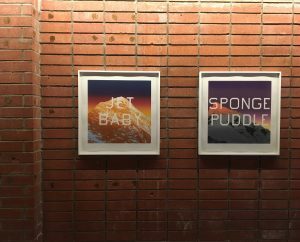 These Standard screen prints are included in the exhibition, but there is a lot more to explore. There are blatant odes to the land the artist holds so dear, like the aqueous orange, Made in California (1971) and colorful Landmark Decay (2006). There are also plenty of past exhibition posters, which of course, Ruscha so meticulously crafted himself. 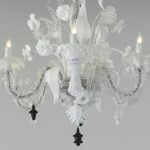 These are plastered on the walls and are held within white wall cases, as are portfolios like Stains (1969), lithographs, and etchings. Two films of his are also on view, including Premium from 1971, in which a man prepares a salad dinner for his date, and Miracle from 1975, which shows a man repairing a car and consequently missing his scheduled date with a woman. 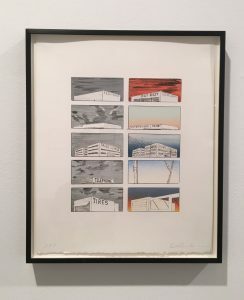 Throughout all of this craft is the seemingly nonpartisan Ed Ruscha that people – and Americans in particular – have come to know and love, and, as this exhibit proves, the Ed Ruscha that has always existed. This level of “detachment” (a word that is so often attributed to his work) is ironically something that could only be achieved by someone who knows what they depict inside and out. 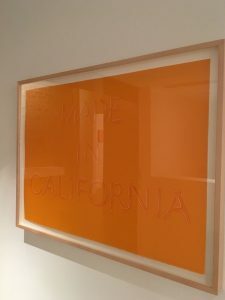 Much of Ruscha’s work is focused on Southern California and the qualities emblazoned in its sunny terrain. 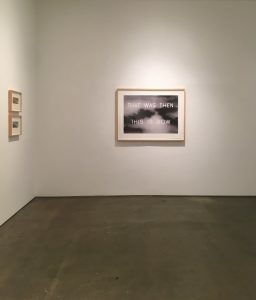 Ruscha moved to here to study at Chouinard Art Institute (now California Institute of the Arts) in 1956, graduating in 1960, and has since been fascinated with its character physically, ideologically and sensationally. 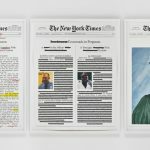 The ephemera, like the subjects they depict, are seemingly plain. 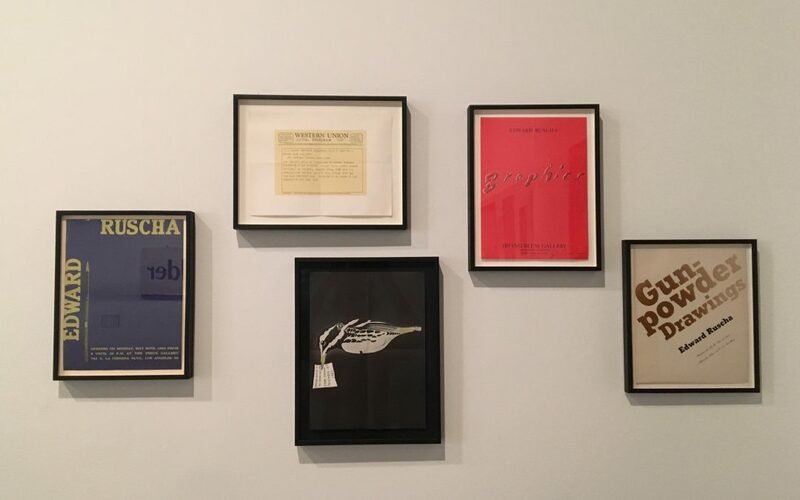 Pamphlets and posters reduce grand sensations into a couple of words, words which become, in an artistic context, shapes with curves and crevices. Paired with backgrounds both ordinary and extraordinary, these words take on new meaning, all the while remaining commanding and witty. The press release sums this up saying that Ruscha, “was struck by the ontological nature of words and their ability to transcend scale. 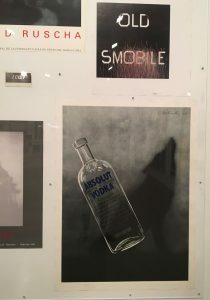 Using text as image, Ruscha conceptually linked meaning with attribute.” Knowing the power of words, he uses them and makes them amorphous, leaving them for the viewer to then interpret and absorb. 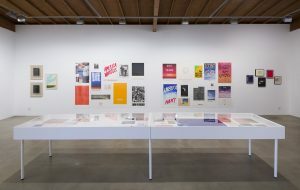 The numerous prints and ephemera in this show testify to the seasoned professionalism that the artist possesses as a printmaker and craftsman. 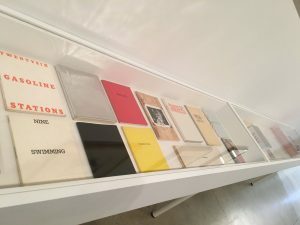 This makes sense: At a young age Ruscha worked for a book printer, then went on to develop his own inks from raw materials, print his own artist books and even establish his own printing company. 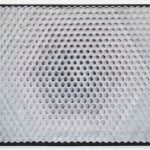 Viewing this work in an increasingly digital age leads one to ponder how it, and the way we consume it, has shifted since, say, 1963. Words no longer must be written out now that they can be typed at lightning speed, even spelled out with enhanced dictation. The display and embrace of only a few words at a time thus lends them an inherently timely lure. 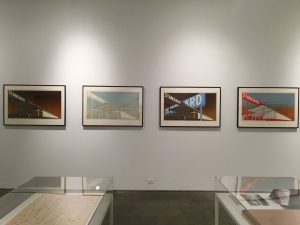 The exhibition “aims to illustrate how these interests in collaboration, materiality, text, typography, and scale have remained throughout Ruscha’s ongoing practice,” and it does just that. This exhibition is more for those who seek to deeper explore the history of Ruscha’s practice, but it also makes the case for artistic self-discipline and investment. 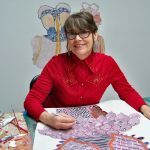 The mastery that comes with his long-running printmaking practice testifies to the power of being invested in work during all stages of creation. Doubtful? Just look at how he’s been able to make a solitary word on paper impact a nation emotionally and humorously, on levels personal and impersonal alike.